Some of us tend to overlook the shopping category when we think about innovative and helpful apps, but thankfully there are a lot of developers out there who do think of it and develop shopping apps accordingly. And when it comes to these shopping apps, users will see that iOS brings some meager options to the table. Sure, both sides have the standard powerhouse apps like eBay, Zappos, and the like, but that is where iOS seems to stop. I have said it before and I will say it again: the third-party developers on Android give their users opportunities and apps that iOS will never be able to match. 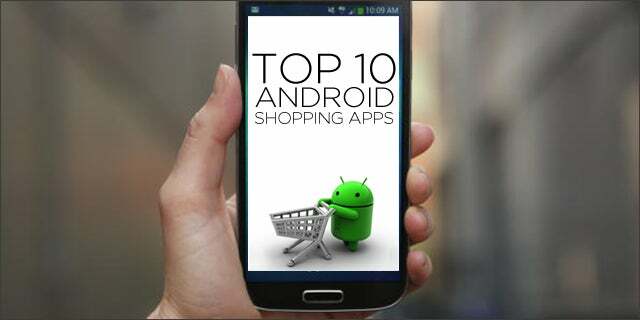 To that end, the Android shopping apps may be small, but they still pack a major punch when it comes time to organize your grocery lists, extend the capability of existing big apps, or take advantage of utilities. You might find lesser counterparts on the iTunes store that accomplish the same things, but you can guarantee they will be hand in hand with poor user reviews. Grocery King Shopping List ($4.99): Avoid the all too familiar pitfall of forgetting to buy crucial items at the store. This app has thousands of preprogrammed food items that you can drag and drop onto your shopping list. Share, sync, or email lists to friends and family to coordinate shopping efforts, and store loyalty cards and coupons for use at the store. Grocery Sum Shopping List ($2.66): This two in one shopping app features a cost estimator plus a grocery list function. The simple user interface lets you quickly add up approximate values of food items to keep a running total going. Switch to the custom color coded list tab to view your items and cross them off as you go along. Mighty Grocery Shopping List ($3.99): This fully customizable grocery list app is one of the fan favorites on the Google Play store. It allows users to create multiple grocery, pantry, to do, and master lists for any shopping excursion. Take advantage of the intelligent voice recognition to avoid typing, store favorite recipes, and back up your lists to a cloud server. Shopping List Pro ($1.99): This app offers an ad free experience in addition to the typical features associated with a shopping list app. However, it features heavy customization options, an automatic alphabetizer, a dynamic cost calculator, and a progress bar that automatically updates as you shop for items on your list. Craigslist by ClasPics (free): This app was designed to take out all the mess and confusion associated with browsing Craigslist. Comb through your favorite categories at light speed and use the alert function to know when a specific item is listed that matches your search criteria. You can also post your own ads, and the app uses as little of your data connection and battery as possible. eBay Widgets (free): If you read my Android widget post then you will understand why this is so cool. This widget pack requires that you have the official eBay app installed on your smartphone, and gives you 3 widgets: shortcuts, reminders, and current deals. They show you what is happening on eBay right from your home screen and let you snipe those auctions for yourself. What’s it worth on eBay ($2.69): This handy app determines the average value of items listed on eBay based off of amalgamated data from successfully sold items over the previous few weeks. This app will help sellers undercut other sellers and fix ‘Buy it Now’ prices accordingly. It also helps buyers who are worried they might be paying too much for an item. Barcode Scanner + (Plus) ($3.00): This is an enhanced version of the free Barcode Scanner app that invokes your smartphone camera to read barcodes and QR codes of all kinds. It elevates the features of its predecessor by using both of the dual core processors in your device, implementing a reimagined user interface, and scanning barcodes from image files. Coinbase Bitcoin Wallet (free): Coinbase, a major player in the Bitcoin game, has given their user base a way to securely use and accept Bitcoin currency from other members of the Bitcoin world. You can also buy and sell Bitcoin at the exchange prices, send and request payments using QR codes and NFC, and you pay no transaction fees at all. Inventory Droid ($4.99): This full inventory management app is designed with the business person in mind to help shopping on a large scale. Scan barcodes, support multiple accounts, create your own categories and fields, and set up payment reminders. Should anything happen to your work, rest assured know it has account backup and restoration.